I figured I'd go with a sports-themed post on this Super Bowl Sunday. 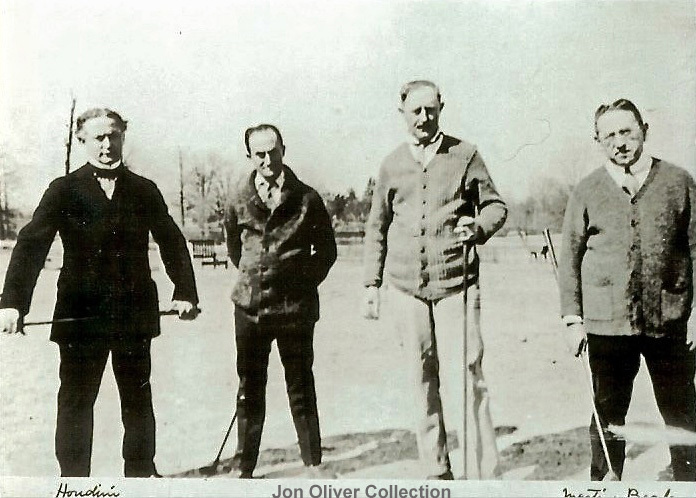 Here is a never before published photo of Houdini on a golf course with his manager, Martin Beck, and two unidentified men. This comes from Jon Oliver who is generously sharing with us rare images from his remarkable collection. "Christopher was not always as smart as he claimed. I asked him about Houdini's golf game, and he told me Houdini never played golf never even stepped on a course in his life. I showed him a photo of Houdini and Martin Beck playing golf and he shot back that the photo was staged!" 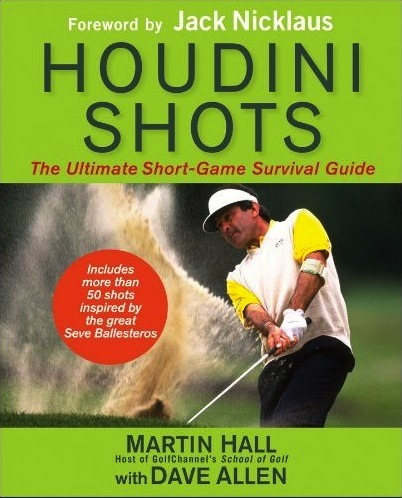 By the way, in March a book will be released called Houdini Shots: The Ultimate Short Game Survival Guide by Martin Hall and Dave Allen. No doubt a collection of techniques employed by Houdini on this very day! But you'll need to wear a three piece suit to pull them off. If we could now just find a photo of Houdini playing football. Happy Super Bowl Sunday, sports fans! Thanks again to Jon Oliver. Interesting that Houdini and Beck stayed friends after the tempest between them in 1900 when Houdini first went to Europe. I would date this photo between 1912 and 1918? Yeah, that's a pretty good dating. Probably closer to 1918. Well observed, Beth. It could be Houdini wasn't actually playing golf with them this day. Maybe he just came to talk to Beck and jumped in the photo with a club. He certainly isn't dressed for it. I also have a picture of Houdini playing golf, it looks like from the same day but they are wearing hats??? I wish I could send you the picture. Oh, wow, I would love to see that.